This month, artists in the Melbourne suburb of Alphington will open their studios and welcome visitors into their creative worlds. Held annually to showcase the work of local artists, the Alphington Open Studio Weekend will return on November 25 and 26. Featured studios will open from 11:00 am to 6:00 pm on both days to give people the opportunity to peruse each artist’s masterpieces and speak with the face behind the work. There will be something for everyone this year, with disciplines including ceramics, drawing, felting, jewellery, mosaics, painting, sculpting, textiles and works on paper. 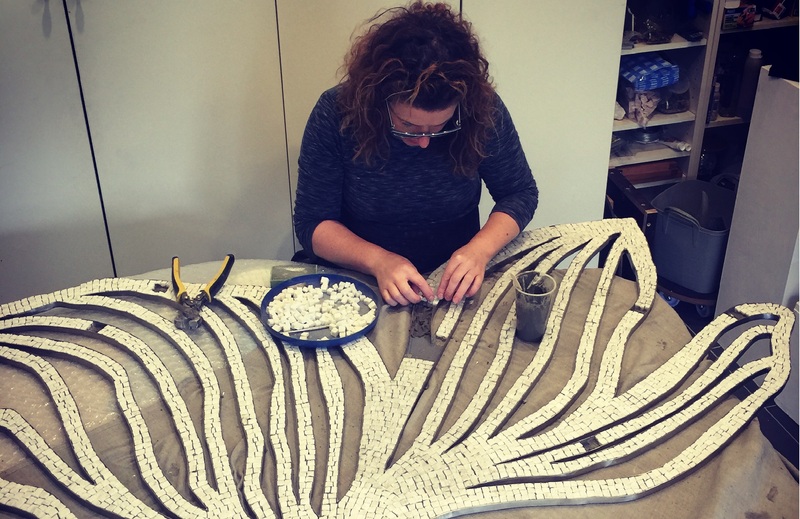 Among the 10 artists set to open their doors to the public this year, is award-winning artist Cetta Pilati, who specialises in marble mosaics and metal sculptures. Ms Pilati’s passion for creating saw her complete a Bachelor of Fine Art in Sculpture at RMIT in 1991, and she has since worked with myriad materials such as steel, glass and wood, to create fascinating pieces. Since 2016, she has also been undertaking a Certificate III in Engineering, specialising in Heavy Fabrication, to develop her welding skills. With a preference for more “natural” materials, the talented artist was also drawn to the beauty of marble travertine and limestone used in mosaics. “My focus soon moved to mosaics and my Italian heritage took me back to Italy, where I studied ancient and traditional methods and approaches to mosaic art,” she said. Ms Pilati’s parents migrated to Australia in the 1960s, and met and married in their new home. Her mother Raffaela was born in the Calabrian town of Taurianova, while her father Domenico hails from Campobasso, in Molise. “My parents both viewed my love and study of art as a very non-traditional pursuit,” Ms Pilati explained. It was during a trip to Italy with her family several years ago, that Ms Pilati spent some time under the tutelage of the great mosaic master, Marco De Luca, in the northern city of Ravenna, famous for its colourful mosaics. “During this time I was able to learn and refine the ancient methods used in Ravenna, as well as learn new techniques in this beautiful art form,” she recalled. Having since honed her skills, Ms Pilati now finds inspiration in life experiences, travel and family to create stunning works of art, most of them commissioned. “My work is about a quiet, forgotten simplicity, a tradition, and my conveying of these two things,” she eloquently explained. Each individual work is realised through a meticulous labour-intensive process, which includes cutting each piece of marble by hand, with the use of a hammer and “hardie”. The Alphington Open Studio Weekend will allow visitors to discover more about Ms Pilati’s creative process and the techniques and equipment involved, before viewing the end result. All marble mosaics and steel artworks on display will be available for purchase, so that visitors can take a little bit of Ms Pilati’s creative genius home with them. For more information on the Alphington Open Studio Weekend, visit the website. For further information on Cetta Pilati’s art practices, visit her website. My work is about a quiet, forgotten simplicity, a tradition, and my conveying of these two things. During this time I was able to learn and refine the ancient methods used in Ravenna as well as learn new techniques in this beautiful art form.